Are the crowd to be trusted? You’d surely have to have been on an arctic expedition yourself to have missed the recent story regarding the National Environmental Research Council (NERC) and their new £200m state-of-the-art polar research vessel. Every ship needs a name, and rather than name her themselves, the NERC decided instead to hand that privilege to the internet. On March 17th, under the guidance of creative agency BlueStag, they launched a crowdsourcing competition using the hashtag #NameOurShip. The first 24 hours was promising. 2000 tweets (including one from the Prime Minister), 7000 name suggestions (Some serious: Shackleton, Endeavour, Henry Worsley… Some less so: Usain Boat, Pingu, Ice Ice Baby…) and some regional press coverage on BBC North West. Two days later, the story was global. 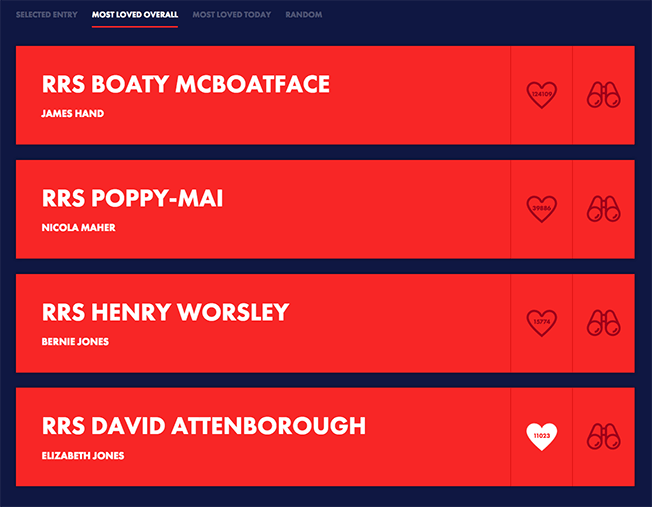 Despite BlueStag advising that “moderating submissions [will] ensure all names are suitable and maintain the integrity of the campaign and the NERC brand”, a cheeky chap called James Hand jokingly suggested the name Boaty McBoatface. Within hours the public had voted for it in their droves, leading to the competition website to crash under the weight of traffic. Soon after, the story had been picked up by news agencies all over the world. 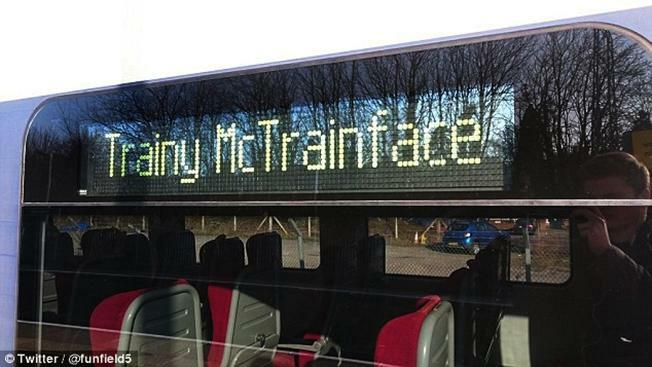 In homage to the name, a UK rail worker renamed the train service between Portsmouth and Waterloo Trainy McTrainface, and in Australia a racing horse was even saddled with the moniker Horsey McHorseface. Two weeks later, and despite the overwhelming popularity of Boaty McBoatface, NERC decided instead to name the vessel the RRS Sir David Attenborough. It had in fact been the fourth most popular suggestion during the campaign, polling just 11,000 votes. And who could argue with their choice? The announcement came just days short of the broadcaster and naturalist’s 90th birthday, and a fitting birthday present it was too. A personal hero of mine, often described as a “national treasure”, the NERC handled the situation very well. They even ensured that the Boaty McBoatface name would live on, announcing that it would grace one of the ships smaller exploration vessels. However, not every organisation would be able to get themselves out of icy water by associating themselves with a figure as peerless and universally loved as Sir David Attenborough. The ‘Boaty saga’ inevitably poses some important questions about crowdsourcing, none more so than if you were going to ignore the will of the people, why ask them in the first place? A Marketing Week article was typical of recent coverage of the story, describing NERC’s competition as “the latest crowdsourcing disaster” and listing it alongside other (sometimes hilarious) examples of crowdsourcing ‘mishaps’. The article, like many others, seems to conclude that brands can’t (and shouldn’t) trust you, the people, to co-create with them. So are the public determined to embarrass your brand online? Will the bullies and trolls, so often found on social media, seize their chance? At 100%Open our experience is the opposite. In the last few years we’ve ran crowdsourcing communities with huge global brands like Carlsberg, P&G and the ICRC and have found the public to be generous, helpful and constructive. So how is it that our experience contains no Boaty embarrassments? There are at least 4 key reasons. We like to think of them as four golden rules for crowdsourcing with public crowds. Considered Challenge Design. A careful challenge design (see our Challenge Design tool for a how to) considers all angles of the process and helps create a clear brief. What is the objective(s)? How will we ultimately select the winner? What are the incentives to take part? What is the recruitment plan? Openness. If the brand is open about the objectives, the rewards of participating and the judging process, people will feel like they are being treated as equals and will participate in good spirit. Facilitation. All 100%Open crowdsourcing challenges are facilitated by an experienced member of our team. Our facilitators welcome new sign-ups, monitor all comments and ideas and champion the cause. Community members are aware that there’s light touch supervision, and it helps foster collaborative behaviour. Any rare inappropriate or bad behaviour is quickly quenched. The social media explosion of the last decade has enabled brands to have unprecedented access to their customers. Crowdsourcing is still a relatively new path for big organisations to go down, but it is a journey that more and more are choosing to take. Crowdsourcing is not to be feared, but embraced, and if you consider your approach making sure to take heed of the above points, the results will exceed your expectations. Those at the top of the NERC may have had one or two sleepless nights during the campaign, but was it really all that bad? On social media, #boaty reached 250 million people. The campaign hashtag #NameOurShip was used 23 million times. Thousands of people watched the NERC’s videos online. TV heavyweights Jonathan Ross and Ant and Dec even gave the story some air time. As Marketing Week (and others) should know, a little publicity never hurt anyone. Totally agree Murray. Crowdsourcing is only risky if it’s ineptly conceived and managed.